Future Pinball is a real time Pinball Development System. 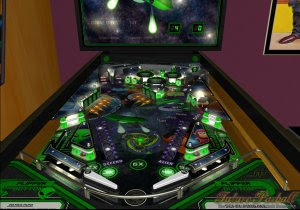 It allows you to design and play your very own pinball simulation in True real time 3D. It uses Advanced Physics to provide the best possible Simulation of a true to life pinball machine. Tables are built up out of Standard components (Plastics, Pegs, Bumpers, Lights etc..) which are placed onto the playfield via the Editor. Objects like Surfaces, Lights and Rubbers are shapeable within the editor and generated real-time when the table is played. Other objects (Bumpers, Flippers, Gates, Triggers, Targets etc..) use pre-made 3d Models (of which there is a nice selection of each type).